Nitrates in a saltwater aquarium are the result of nitrifying bacteria, and occurs naturally in all aquariums. Nitrates can be a nuisance for aquarium owners when they build up to dangerous levels. High nitrate levels can stress fish and cause ill effects. Nitrates are also basically food for algae, and high nitrate levels will likely be a cause of excess nuisance algae. 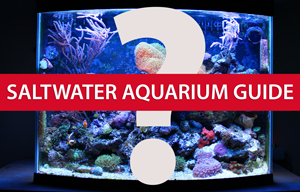 In most aquariums, nitrate levels of around 30-40 ppm are the highest that you will want to allow. The basic idea is to keep your nitrate levels as low as possible. Aim for 10 ppm or less for optimal fish health and aquarium stability. Use an aquarium water test kit to routinely check nitrate levels. Liquid test kits are available, and quick test strips can also be used. I find the quick test strips to be a lot more convenient and they seem to promote more regular testing because of the ease of use. Nitrate prevention should be the first issue to address. Routinely remove waste from the aquarium. Try not to overload your aquarium with livestock. Use a protein skimmer. Even with good waste removal being performed on a consistent basis, you will probably still need to employ some other methods to further control and reduce nitrate levels. Mangrove plants are popular for reducing nitrates in saltwater aquariums. They can be placed in a sump or even right in an aquarium. They feed on the waste and other nutrients in the water, and as a result reduce nitrate and phosphate levels. If enough mangroves are employed, a protein skimmer will not need to work as hard, which is a nice plus as well. Both live rock and live sand can be used in an aquarium to naturally reduce nitrates. Both of these will act as a biological filter as well as provide natural shelter for many creatures in your aquarium. The surface area of a live rock land scape with live sand is much more than could possibly be available in a mechanical biological filter. Healthy saltwater aquariums employ both of these to provide the main biological base to control nitrates in an aquarium. Any of these will help you address the areas that will affect nitrate levels. Keeping nitrate levels under control will keep your aquarium healthy and your fish stress free. Keep testing water parameters and keep addressing problem areas, and you’ll have nitrates under control in no time.